Students at Tewksbury Elementary engaged in a game of “Eat More, Eat Some, and Eat Less”, applying the lessons they learned about “fueling in the green” (i.e. 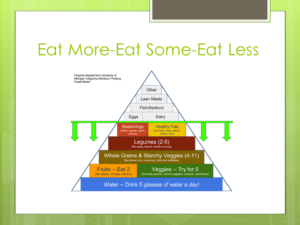 focusing mostly on items below the green line) and principles adapted from the University of Michigan’s Department of Integrative Medicine’s “Healing Foods Pyramid”. Tewksbury township faculty, parents, and educational foundation continue to lead the charge in creating a healthy and wellness focused environments for their students to thrive.